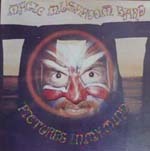 Twenty years ago on 4th November 1991 Magick Eye Records released their first release which was another first as it was the first single release by the Magic Mushroom Band (MMB). MMB had already built up a following having released a few albums on their own and other labels when the band's Swordfish met with former musical collaborator Chris Hillman. Following a discussion in Swordfish's recording studio Chris decided to set up the Magick Eye record label, named after the title of the MMB track that was to become the band's second single. The first single release was to be the uplifting psychedelic rock anthem 'Pictures In My Mind' taken from the band's 'Spaced Out' album. A great track which soon picked up support from Radio 1's John Peel and Mark Radcliffe amongst others. The single ushered in a period of the MMB going from strength to strength with further great albums and singles during the next few years. Also included on the 3 track single was the psych dance epic 'Squatter In The House' which was a precursor for what MMB's offshoot, 'Astralasia' was to become plus the epic cover of the Byrds classic 'Eight Miles High'. Initial copies of the vinyl included a packet of dried mushrooms - added as a bit of fun. The mushrooms were totally innocent having been purchased from a supermarket. However one poor record store assistant was nearly sacked when his boss found the packet and thought his staff member had something that was not quite so innocent. Luckily a phone call to the guy's boss put the matter straight and all was ok!! Now 20 years on you can hear where it all began with the single being available for digital release and limited versions of the original CD single and 12" being available from the Magick Eye web site online store.